Abu Dhabi Construction Company (ADCC) LLC, is a 100% national company established in 1966, as a personal initiative of the Late Mr. Hamel bin Khadem Al-Ghaith, to provide high quality specialized services in surface protection, painting, fireproofing, thermal insulation, online cold/cryogenic insulation, and scaffolding works to oil, gas and industrial companies. ADCC LLC has been recognized as a pioneer within its scope of activities, under the leadership and guidance of its Chairman, Mr. Ghaith bin Hamel bin Khadem Al-Ghaith, enabling it to successfully fulfill all its undertakings and obligations. ADCC total staff exceeds 450 employees in different specializations at Das Island, and other offshore facilities, including professional and specialized experts, maintenance engineers, industrial engineers, technical supervisors, site operation experts, in addition to specialized labor force. 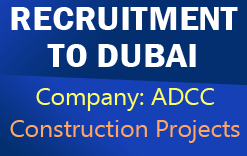 Abu Dhabi Construction Company required staff for their upcoming construction projects in Dubai.